Random fact about me: Did you know that I cannot type the word ‘Applesauce’ without spelling appleCAUSE at least twice before finally getting it right? Yeah, it’s just one of those things that my fingers won’t let me do. It’s annoying and slightly embarrassing, but that’s just the way my fingers naturally move. Maybe it has something to do with muscle memory and all the years of piano I played. Anyway, I didn’t come here to write about my lack of abilities to type words correctly. I’d much rather tell you about my love for fall-time. When I think of Autumn, I think of Pumpkins, Apples, Cinnamon, and Clove. Most people are on their way to thinking about peppermint, gingerbread, and egg nog as soon as Halloween ends. But I can’t tell you how much I love the smell of cinnamon and spices baking on a cool crisp fall day. I absolutely love it more than I love peppermint mocha lattes. And I’m definitely a fan of crunchy fall leaves more than I am a fan of wet and cold snow. There is no way I’m about to pass up all the opportunities to bake delicious fall flavors throughout the month of November. So a couple of weeks ago, I discovered something wonderfully amazing. I don’t know how it’s taken me this long to figure this out, but it is ridiculously easy to make applesauce at home! Seriously, why am I just now learning this in my thirtieth year on this Earth? For one, the ease of making applesauce is awesome. Secondly, the taste of homemade cinnamon applesauce is out of this world delicious. There’s just nothing like it. I’m totally spoiled by it now and will probably never enjoy a jar of store-bought applesauce ever again. The best part about it is that you can truly throw it all in your crock-pot for about 4 hours, fish out the cinnamon sticks, and stir it up a bit. That’s all there is to it! If you have about a dozen apples, you can absolutely make this happen and have your home whipped into festive shape in no-time! Add all ingredients to a large crock-pot. Cook on high for 4 hours, stirring about every hour to get the liquids moving. Once finished, remove cinnamon sticks. Mash slightly with a wooden spoon for a chunkier applesauce (my preference). Or run through a food processor or immersion blender for a smooth applesauce. Keeps in jars or containers for a few weeks. Or you could can it if you are familiar with that process. Unfortunately, I'm not. Imagine your whole house smelling like it! So good! This looks delicious! I love me some applesauce. Canning is really not difficult. I can tomatoes, tomato sauce, salsa, apple sauce, apple butter, jam, relish etc. Go to the Ball canning website. They give very good directions. Don’t panic and you’ll be canning in no time! It might help to ask someone who knows how to can for help the first time. That’s what I did. 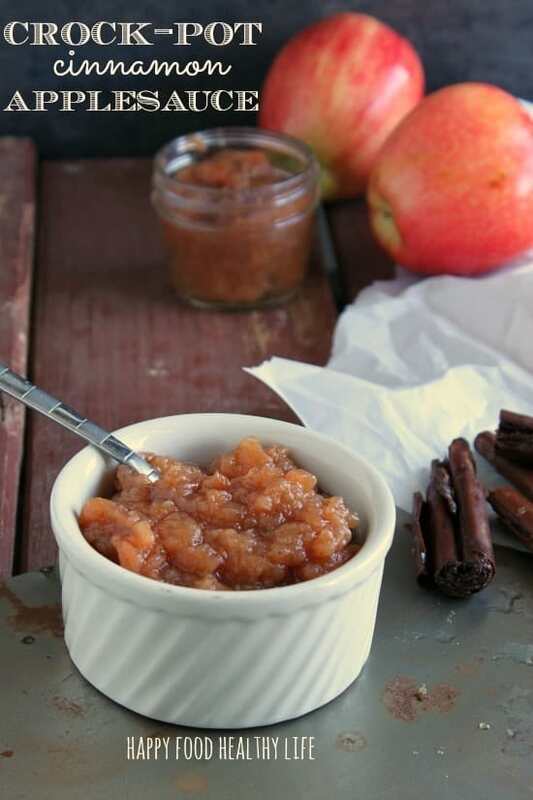 As for freezing, it works great for apple sauce. I’ve done that often as well. That’s great to know. I really should just dive right into it one of these days! I have definitely not moved on from these flavors and scents! Looks great! Thanks for linking to Less Laundry More Linking party! 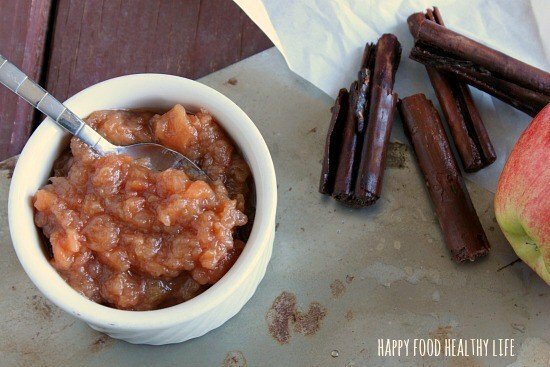 Looks great- I love homemade applesauce- pinned it. Found your blog on the Inspiration Monday link party and started following on Google +.